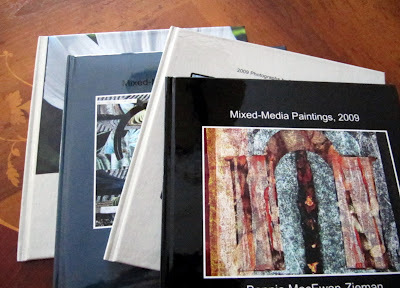 Some of the gifts I am giving this year are 2010 calendars made with my photographs and artwork. While the sites that help you do this (Snapfish, Shutterfly, etc.) have templates that facilitate the process, it is still up to you to choose the layout, design, backgrounds, fonts, paper colours and textures, number of images per page, accompanying text, and so on. 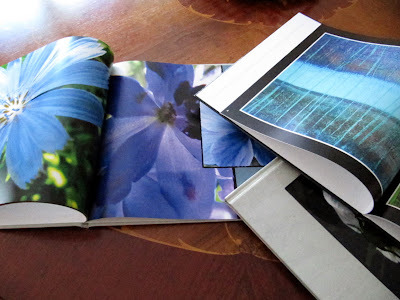 It takes a fair bit of time to design a photo book or calendar, and you also have to allow for the time it takes to download all the images you want to use onto their site before you can begin your design work. I would rather, however, spend my time doing that than shopping in cookie-cutter, look-alike stores that we find in malls. Mind you, I could not totally avoid mall shopping, but the days I was working at home designing calendars and photo books, I was much happier and stress free. Internet shopping is often a less stressful way to shop....if you allow adequate time for delivery. 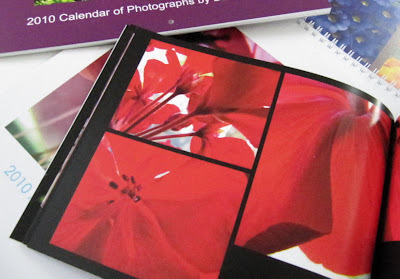 Above are a few of the new 2010 calendars with my photographs. More calendars. 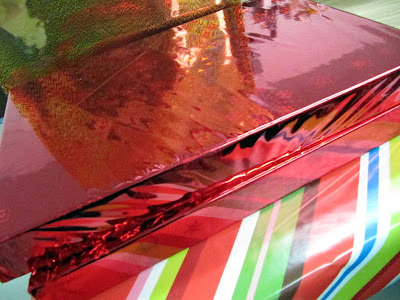 I designed some (already wrapped) using my children's photographs of trips (Spain, for example). and others with photographs of beloved children for their parents. You can design gifts that are relevant, specific and unique for the recipients. Occasionally an image that looked great in the design on the computer screen does not measure up in print, but it is rare. For example, the bottom left image in the red grouping above does not compare to what I saw on the screen. I guess it is to be expected. 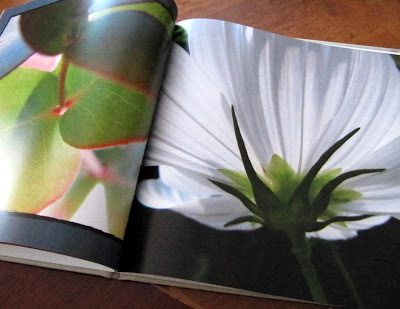 You can design each page differently. So above you see one picture on the right that takes up the entire page, whereas on the left the picture is smaller and framed in a border. You can add text to accompany your images if you so choose. Again above there are more coffee table photo books. If you look closely you will see that you can put smaller inserts of smaller images over others. There are dozens of variations in design available. I'm sure many of you are doing this already. If so, I would love to hear what site you use and your experience with it. I originally started with Snapfish but have worked more with Shutterfly of late. Too many errors with Snapfish Canada, but I have heard that Snapfish in the States is very good. Shutterfly has given me excellent quality and service. Then all you have to do is decide what goes to whom, wrap and deliver them. For years I've been thinking about making calendars using my photos. This year I worked up one to use in my office. Husband saw it and admired it so enthusiastically that I told him to take it to his office. The comments he receives and relays to me and hugely gratifying. I still needed a calendar for my office so I did up another one, and then another two for a couple of friends, with their photos on their birthdates. It's a project that was a LOT of fun for me, and I think it means a great deal to the giftees. You're right about some of the colors not coming out quite right....a picture of some pink roses was blindingly contrasted in print ...on ONE of the calendars. The rest of them were fine. Hit and miss a little bit I guess. But still, I plan on making it a regular undertaking. My Mac has the ability to make calendars, but I have never attempted it. What you have done is very professional. I imagine the recipients will be very happy with their gift. They look gorgeous. Last year my daughter did one with pictures of the grandkids. These are just wonderful.. Lucky friends :)) One of the best gift I received last year was from a photographer fried. He made playing cards using his African travels. It was fabulous.. Your work is beautiful and the books you display are breath taking. I created a book of my husband's life (as a World Champion Bull Rider and a Bush Pilot) for his son this year. I use iMac and the software is contained in iPhoto. It is easy and the results are truly unbelievable. Are your sites pc specific? I really love the iMac's versatility where graphics are concerned, but so much is totally pc integrated that we are somewhat limited. Would love to be on your Christmas List! Bonnie, what wonderful gifts and photos! I will have to plan ahead for next year. Also, Turquoise Diaries mentioned playing card which I will have to look into as well. What great ideas! Wow, you are so talented. Lovely gift ideas. Lovely. oh, how very nice...what a cool thing as well, since they know it came from your labors...adds sucha persoanl touch...lovely. I love thoughtful personalized gifts like this. Merry Christmas.